The last 6 months have been overly crazy and busy in my already too busy world. 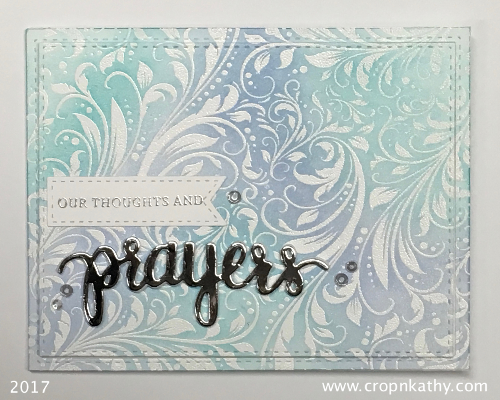 I made 10 sympathy cards in the fall when I found a design I liked (Thanks Lou Lou!) and went crazy making backgrounds. I decided to turn them all into sympathy or "prayers" cards as I thought that could cover a few occasions. As it turns out I have used every one of those cards. The staff at my school have lost many loved ones this fall and that continues on into January. I am not sure I have ever made this many bereavement cards, but here I am adding to my stash again as two more colleagues have lost loved ones. Perhaps I am getting older and that is just the point I am at in my life as I also lost my Baba this fall. She was the first of this domino effect. Anyhoo, my card design is simple and I am following two of my favourite previous designs that I have not ever posted on my blog. 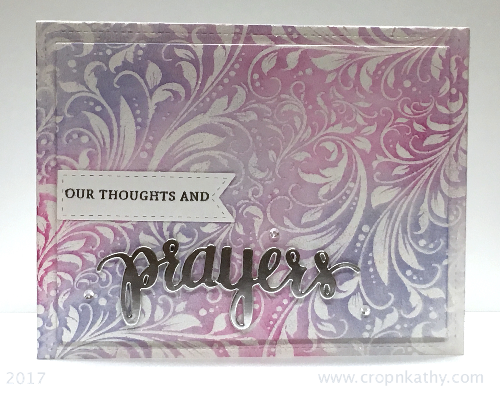 Of course I am using one of my most used stamp set and matching die from Hero Arts (was originally a Stamptember set with Simon Says Stamp) called Prayers. 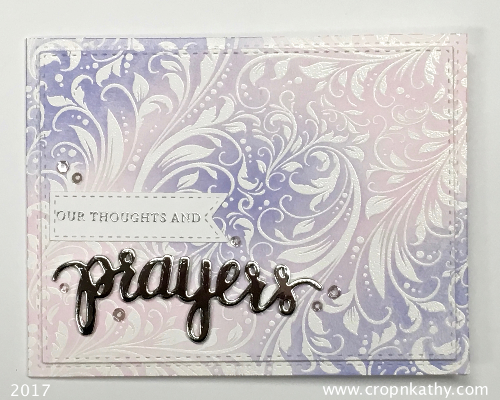 I used distress inks and an MFT background stamp called Garden Flourish and some embellishments from Pretty Pink Posh. The silver cardstock is also from MFT as is the one set of rectangle frame dies. The other set of dies is from Simon Says Stamp and is one of my most utilized dies sets. ** Sorry about the photos . . . winter photography and poor lighting. thanks a lot for these ideas! I like all your cards! I love your design very much. That would be great to have one and write down my thoughts and prayers there. very beautiful, I like the first and second. And what are they for?